Mothers day is only a few days away from today and will be a perfect day to date your mom and spoil her this weekend. Having a hard time choosing where to take her on Mothers Day? Being a mom of four boys, I do expect suprises sometimes but I never wanted it to be grand. I am most happy when my boys take me out to dinner to celebrate mothers day over good food. Have you thought of a perfect place yet where to take her on Sunday?' 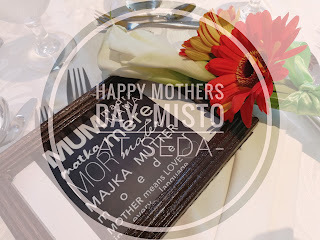 Think no more because Seda Abreeza's Misto prepared something special to celebrate Mothers Day Lunch. A lunch buffet! Is your mom a food lover?' If yes, she will surely love the food Misto prepared by Chef Bang and her culinary team. Mothers day is celebrated worldwide yearly every second Sunday of May, appreciating the sacrifices and the unconditional love of a mother to her child or children. On this day, most moms are pampered to a rest day, a no-chores-day. (cant wait!) Others prefer to just spend a quiet time at home.